Many new PC’s come with a memory card reader installed. When you open Windows Explorer, you can’t really where they are. 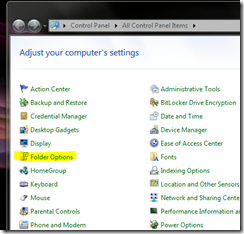 Windows has an option in the Folder Options that allows you to view all the drives, along with the drive letters assigned to them. Follow these few easy steps to get this as default. 1. Open Control Panel. Start > Control Panel. 3. Click the View tab. 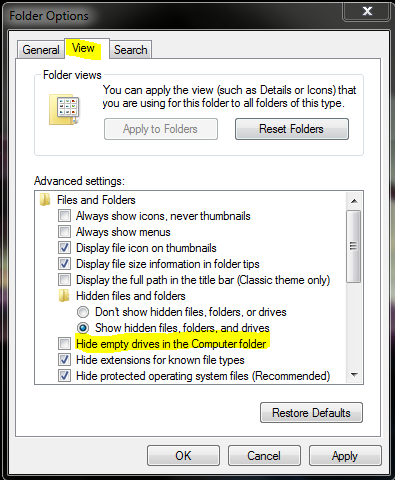 Then UN-Check the option that says “Hide empty drives in the Computer folder”. Then click OK.
4. 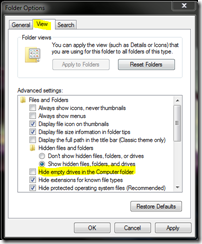 Now, when you browse your computer using Windows Explorer, you will notice a few extra drives. Do note that if you try to open one without a card installed, you will get an error. Previous post: 2012: Year of Windows Tablet Takeover?